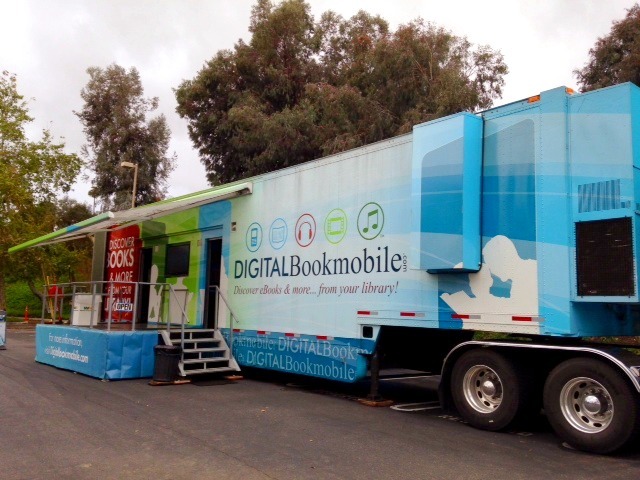 Posted on March 5, 2014 by Leila S.
Some rainy weather on Saturday, March 1 could not keep the 140+ eager visitors from stopping by the Digital Bookmobile in the Mission Viejo Library parking lot. The event took place from 10 am to 4 pm. The Digital Bookmobile is an 18-wheel truck, sponsored by OverDrive, which is full of interactive devices to teach others about the digital media technology. The truck featured several computers where visitors were encouraged to explore different kinds of media. Guests could browse the available selection of digital materials and preview eBooks or listen to a song! An informational video was showing on a television screen to further elaborate on how to use the OverDrive digital library. 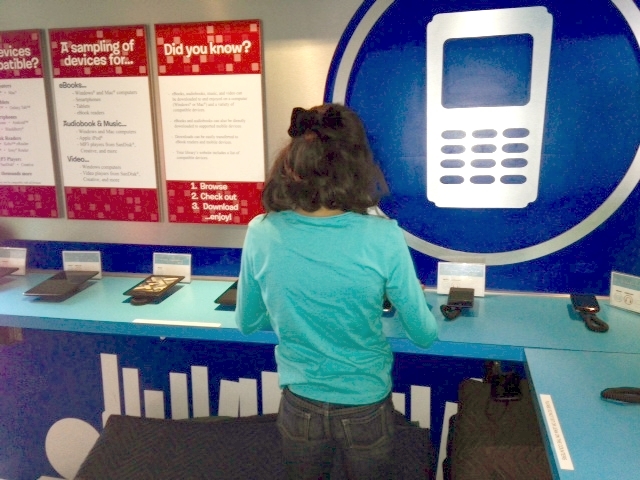 In addition, there were knowledgeable staff members available to answer any questions and walk visitors through the process of downloading an app onto their device(s), signing onto the library, and borrowing an eBook or audio book. Depending on the device you wish to use for viewing or listening to your digital media, it is recommended that you download the OverDrive Media Console app. From there, search for an eBook and click to borrow and then finally to download it. Your item will be checked out for two weeks, after which it will automatically expire, unless you renew it. And for all you avid readers, this means no late fees! Overall, this event was quite informational. I have already downloaded the app and browsed the wide selection on Mission Viejo Library’s “virtual branch,” the Southern California Digital Library. In addition to all the media they already have, Katie Yap explained that OverDrive is now looking into putting textbooks and other educational resources online so that students can work on those research papers even when the library is closed! Posted on December 19, 2013 by Angela J. Back in June, another blogger, Sarah B., wrote this wonderful post about the debate over ebooks which included some great information on the history of ebooks, and most recently Leila S. made great visual representation of the differences between the two. Today, I would like to talk more about the pros and cons of each. Ebooks have more concrete pros and cons than print books do, a lot of the things that make print books great have more to do with preferences, while ebooks are more about convenience. First off, let’s take a look at the pros of ebooks. Size: For me this is one of the greatest things about ebooks– you can fit hundreds on one small device, which- when you love reading- is an amazing thing. This small size is also great for traveling. Font Options: Most ebooks let you adjust the font size to your liking, you can have anything from huge and easy to read to super small which lead to less “page turning”. This is a great feature especially if reading small print is difficult for you. Some e-readers also let you change the color and font type to make the font easier on the eyes. Brightness: Many ereaders have either the ability to change the screen brightness or come with a built in light which makes it easier to read in any lighting condition, from dark nights to bright days outside. Cost: Often times ebooks are cheaper than there print counterparts, and many classics are even offered for free. This is great for saving money. Start-up Cost: To read ebooks you will need to get an e-reader, and even though there are e-readers priced at every budget level it can still be an investment, especially if you’re not totally sold on the idea. Needs to be Charged: For light day to day reading at home battery life shouldn’t be a problem, but for long car trips or camping then having to have an electrical outlet can be a problem. Hard to Lend Books: While there are some programs, like the Amazon Kindle Owners Lending Library, that allow ebooks to be lent to friends and family, it can be a hassle to figure out the system,not to mention all parties involved would need a device. Digital Feel: For me part of the joy of reading is the book itself, the texture, the smell, the weight, and with ereaders, you just don’t get that. Next I would like to talk about the pros of print books. Easy to Share: Lending print books couldn’t be easier– just grab the book and pass it along; no set-up or hassle involved. The Whole Experience: There is just something about print books that ebook can’t compete with, the way the spine cracks the fist time it’s open, the way the pages feel in your hands, the rich scent of paper, the way they wear over time and gain character. 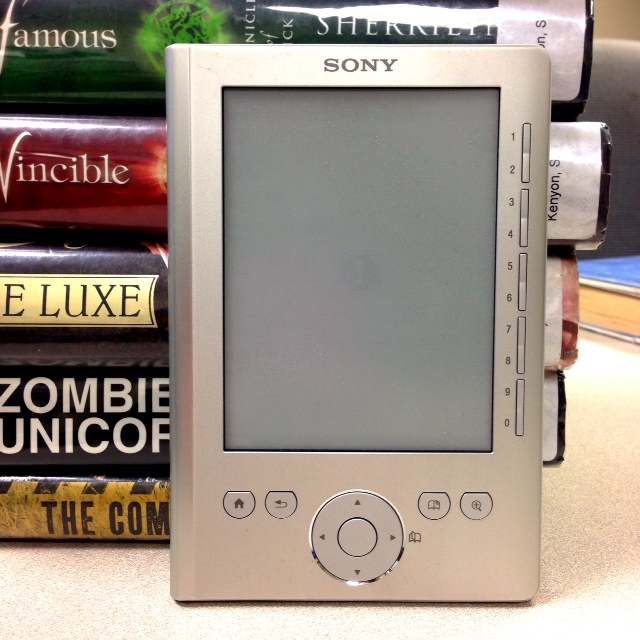 Sentimental Value: While ebooks are probably going to be around for quite a while, there is something really special about being able to hold something in your hands that your parents, grandparents, and other family members had when they were young. No Battery Required: With print books it’s grab and go– no need to worry about being miles away from electricity. And finally, onto the cons of print books. Size: The fact is print books take up space, and a lot of it. For avid readers it’s only a matter of time before the books move from the bookshelf onto tables, chairs, the floor, and anywhere that they will fit. Cost: Print books, especially hardcovers, can add up fast. Although buying used or checking free carts at libraries can help, that can be a gamble and pursuing the newest book will usually result in a trip to the store. Reading Conditions: Print books need light, and sometimes that can be a problem, especially if you’re a fan of reading at night before bed or on long night car trips. Durability: Paper degrades over time, and while this won’t typically be a huge problem, it can be a hindrance if you like to travel with books or plan on passing them down to future generations. The plus side is this wear is usually just something that gives the book character and not a deal breaker. Overall, both ebooks and print books have many advantages and disadvantages and when it comes down to it, it’s all about preference. Whatever you choose– read on! Posted on November 29, 2013 by Leila S.
Do you have bookshelves full of books, or a tablet on which plenty of books are stored? These are two ways that people today can read. A person can read in the traditional way with a printed book. Or, books can be read virtually on any electronic device. Both of these forms of reading have their advantages and disadvantages. Below, the main reasons for and against each side are presented. Now that you have more information on this debate, which method do you believe is better? Or would you prefer to read with a combination of both? Whatever you chose, just make sure you read! Posted on June 19, 2013 by Sarah B. The ebooks vs. print books debate has created a controversy dating back to when electronic books were first invented. Electronic books were created alongside the computer and the Internet. One of the oldest publishers of ebooks, Project Gutenberg, began in the 1970s and is still operating today. They publish works that are public domain which means that they are no longer copyrighted and are therefore available to the general public at no charge. An example of writing deemed public domain is the works of William Shakespeare. Ebooks were originally intended to be subject or genre specific. They were also originally intended to be educational. Ebooks gained popularity in the late 1990s but were used primarily in libraries. Nowadays, ebooks are used by a wide array of people virtually anywhere. 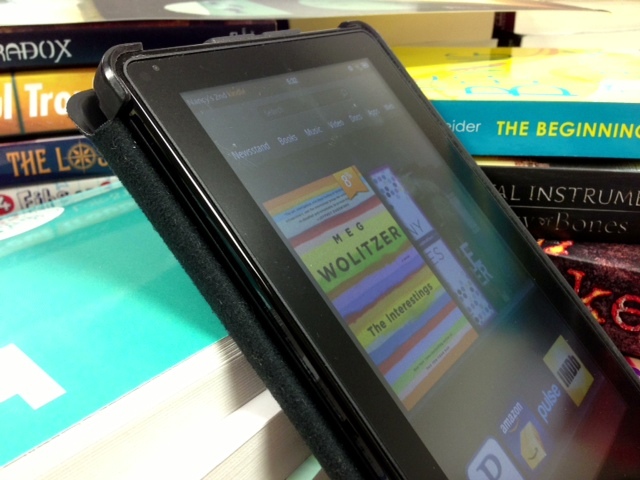 There are many devices suited for ebooks such as Kindles and Nooks. I know that we live in the age of technology but I personally prefer the written word. I am a bibliophile! I cherish books. I love their scent, the texture of their pages, and their physical presence. To me, an ebook cannot compare. Ebooks are more accessible, but I enjoy searching for print books themselves. It is the romantic qualities of books that makes it hard for me to accept ebooks. There is just a special something about real paper books that I cannot articulate and that ebooks cannot emulate. I understand that this is the age of technology and that books can and most likely will become an antiquity but Johannes Gutenberg did not invent the printing press in vain! I will always appreciate books, no matter how archaic they become. It scares me that the printed word might cease to exist because as an aspiring writer my dream is to see my stories live in ink and that dream might not come true. However, it’s important to remember that the vitality of books is their content– so regardless of the format you prefer, the importance is always placed upon the reading itself. So read on, however you will!